In 2012, my sister, Jill, and best friends hosted two baby showers for our first born son, Teddy. They were beautifully decorated, had sweet little baby details, were attended by the ones who mean the most to me. We received a new stash of baby items from our loved ones for our expected babe. Many prayers were prayed over us, both during the showers and throughout the pregnancy. In 2013, I told some friends we were expecting our second born and they excitedly offered to host a “sprinkle” for us. Soon after this offer, we realized our baby’s body was rather sick and he, Simon, may not be with us long. No sprinkle needed to be hosted, few gifts were bought, but prayers abound. Simon was born breathing May 14, 2014 and lived for seven days and twenty-two glorious minutes. Not knowing prior to his birth if he would be joining us at home, we had the privilege of pulling out the gifts we received from Teddy's baby showers and dusted them off one-by-one: the bassinet, the stroller, and the pacifiers. After Simon’s death, while still in the depths of grief, we had a desire to continue to grow our family. We became pregnant three months after Simon’s birth with our third baby. This baby stayed with us for 13 weeks in utero and quietly slipped into Jesus’ arms while in utero – six months to the day of Simon’s death in November 2014. I birthed this sweet baby’s body and could tell by sight he was indeed a little boy. We named him Thomas. Adam and I clung to one another and to Jesus as we asked him to guide our footsteps. Prayer was my only way to get through this time. We wondered why he didn’t take this cup from us. We didn’t want to lose again and so quickly after our previous loss. This song, Garden, by Need to Breathe, seemed to be my anthem. A little over a month after the loss of Thomas, we remarkably became pregnant again with our fourth in early 2015. We were tired but smiled with God at the blessing of this new child. We were scared and our family and friends knew this. Unbeknownst to us, our friend, Kylie, began a prayer journal for us about six months prior to our fourth born’s birth. She carried this book (photos below) around with her everywhere. She prayed for us and wrote out her prayers. She shared this book with other friends to join her in praying for us. My own prayers during this fourth pregnancy were so simple. My brain scrambled with grief and joy; getting through the day caring for both Teddy, my pregnant body and my heart completely exhausted me most days. My daily prayer that I meditated on was, Your will. Not mine. Nothing more. Nothing less. Your will. It’s like I had finally run out of MY specific request for the Lord. Complete submission? Probably not, but certainly doing my very best to submit completely. At 38 weeks gestation with our fourth born, my ob had some concerns with our baby’s heartbeat and decided to induce. A good friend of mine, Courtney, committed to praying for us outside of our delivery room for something like seven hours. I had confessed to Courtney that I was worried our fourth baby would be stillborn. I am reminded of God’s grace for today (Matt 6:34), for reality. Not for made up scenarios in our head. I knew this truth, but fear still gripped me. Courtney prayed, laid hands on the walls, and even left a cold coffee with the nurses for me to enjoy after delivery. This – this was a gift. Knowing she was feet away from our room, praying. Sitting with God. Waiting to see His plan for our baby's life. Courtney did the only thing she could do in that moment in the waiting room, pray. Intercede and ask for her specific desires for our family. For a baby who would take a deep breath and let us see his chest rise and lower. Peter, our fourth born, was born with a triumphant cry on September 24, 2015. 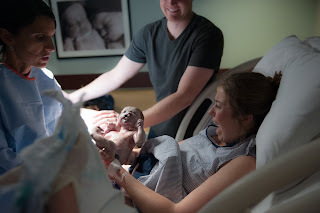 The delivery room was as holy as it was for our three previous deliveries. Sacred and full of blessing. After Peter’s birth, Kylie presented us with our prayer book. I can say, without hesitation, this book is the best new baby gift I have ever received. The prayers for Peter during his pregnancy. Through Simon, Thomas and Peter’s pregnancies, I have learned there is no better gift to offer a family expecting a child than prayer. If you are considering hosting a baby shower for a family, I would love to encourage you to also create a prayer book or maybe even host a prayer shower. Hear me – gifts and things are important when anticipating a new bundle. Without question. Diapers and clothes are a necessity. Showering an expecting mom and her little baby honor them. And, of course, the family needs practical stuff. But they also need prayers. Prayers while baby is being knit in utero in mommy’s belly. Could I be bold enough to say that we need the prayers more than the stuff? Jesus tells us, when we pray, start with “Our Father.” Our prayers can be written, thought, said out loud, alone, with another person, or a group. I’ve learned from great mentors and pastors that even in the times when our brains are foggy and cluttered, our eyes blurry with tears and no clear thought can be made – we can simply say, Father, Jesus, Daddy, Abba. Crying out his name is a prayer bring us into instant communion with our great Creator. I do not claim to be an expert in prayer – I’m a student until the day I die. But I do know, from my own experience, having an ongoing “dialogue” of prayer with the Lord is good for my soul, my anxiety, and my personal relationship with Jesus Christ. If prayer seems a bit foreign to you, may I suggest you start with something simple, like a gratitude journal? Eucharisteo (Luke 22:19) has a way of drawing you more near, assists in changing your perspective, and gives God thanks for the little things, the big things and everything in between. I'm not giving us a pass on spending time in the word (meaning, the Bible, God's word), but, in these tiresome days of raising a young family, there are some days the best time I have to give to the Lord is through prayer as I fold laundry, drive or do dishes. In our society, we say phrases like, “I’ll be thinking of you and praying for you!” but do we really do this? Possibly you could actually pray for a friend or even Facebook friend that you said you’d be praying for them? I believe our intentions are good when we tell someone we are praying for them, but we forget. Either write their prayer request down or immediately, right in the moment that you said you are going to pray for them, do it. Follow through on your word. The ACTS method of prayer (Adoration, Confession, Thanksgiving, and Supplication) is a great guide to our prayers. This acronym can remind us of the elements of prayer I shouldn’t miss, specifically confession for me. It’s important to remember that prayer isn’t magic. Prayer isn’t demanding. Prayer doesn’t take away suffering. What prayer is, is direct communication with our Creator. We are promised He hears our prayers and responds in a loving, all knowing way. All of this to say, God hears and answers our prayers. He may not answer them in the exact way we prefer. But in some way, He does answer. Step one to knowing Christ is to talk to him about yourself and others. God you have taught me how to pray. How to be close to you. I can take this for granted. Forgive me. The close communion I can have with you in an instant, I often look the other way and don't show up to spend time with you. I've had many nights on our cold bathroom floor with you in great sorrow. And I've also sailed high on your wings with great admiration and thanksgiving in pure happiness. You are a great God. Thank you for never leaving me. Lord, you have placed so many in my life that pray for me. My parents, my inlaws, my sister, my family (including many extended family), my very best friends, my church family, my child loss community, strangers, and countless others. What a joy it will be to connect the dots in eternity. What will that feel like? It brings a smile to my face just thinking about it. Thank you for guiding my steps, loving me regardless of my mistakes and promising me eternal life without hurt, fear and sadness. You are magnificent.